Today’s forward-thinking builders hire design consultants to do more than ever before. Well trained professional, knowledgeable design consultants are skillful salespeople, knowledgeable design experts, and confident rapport-builders. It is an antiquated business model to think that after the home sale is made, the design studio team will work with buyers “to pick their colors” (UGH, please don’t say that) so that construction on the home can finally begin. Maybe you have one consultant who works alone, three who split the workload, or a design studio manager overseeing consultants and staff. Any way you slice it, that’s a design studio team. Progressive builders recognize that the design team is an extension of the sales team—critical to customer satisfaction, essential to the bottom line, the hub though which all departments connect, and a sophisticated retailer. Consumers can get their hands on a wealth of information about trends. They watch design shows on TV and they spend hours on Houzz and Pinterest. They actually can walk into your design studios knowing more than your staff—and that’s something you don’t want to happen. Here’s how you can avoid it. a critical part of customer satisfaction: the personal selections experience should be the high point, not the low point, of the customers’ homebuying journey. a huge contributor to the bottom line: helping to drive per-home revenue at high profit margins to significantly impact the company’s revenue and profit. A sophisticated retailer: creating a world-class shopping experience in a state-of-the-art environment, upholding your brand energy and facilitating the shopping experience. Why do some builders view a phenomenal Raving-Fans-level design studio experience as mutually exclusive from one which has a significant positive impact on their bottom line? 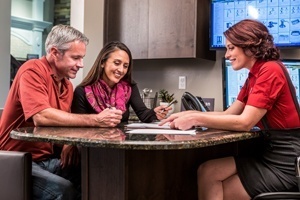 Here’s the truth: when we take the time to honor our homebuyers by properly educating them so they can make informed decisions; when we facilitate the decision-making process so they can make quick, confident and lasting decisions; when we create a joyful experience that they will fondly remember for years to come; when we emotionally connect them to a unique home which satisfies their own wants and needs…it’s no surprise that they decide to invest more into their brand new home. And that’s a win for everyone involved. Start by inviting your design team to the next sales training. Sure, the subject matter is a bit different, but the skills translate directly—building rapport, answering objections, offering clear and useful information to customers. Plus, getting the two teams together is great for overall team-building. Bring in a trainer specific to design centers. Perhaps your design studio team loves working with people, has a passion for design, and has been “selling options” for years. But it doesn’t necessarily mean they’re proficient enough to sell to today’s super-informed buyers. Train a design team through internal or external resources so they’ll be able to speak with authority about design trends, connecting product solutions to buyer needs. They’ll be able to discuss the technical benefits of each product (to increase perceived values). And, of course, they’ll get to sharpen sales skills. Craft knowledge into compelling scripts. Write scripts that help your team impart knowledge via meaningful statements that resonate enough to influence buyer behavior. Spend time on memorization and practice. Michael Jordan said “I practiced so hard the games were often easier”. Once information is crafted into scripts, the team needs time to memorize and practice them in the form of role-playing. Not allowing time for this is one of the biggest mistakes I see builders making. Implementing, measuring, and refining. Of course, there has to be a return on your investment. Set goals, measure the impact of training and preparation, and refine. Then do it again—and be sure to reward those who excel. The bar is being raised in every consumer goods and services industry segment. Salespeople in every store need to be more knowledgeable and more skilled to meet the ever-increasing demands of today’s well-educated shoppers. Your design team (who ARE salespeople) is selling arguably the most expensive and emotional investment someone will make in their lifetime. Is your design team as well prepared, professional, and knowledgeable as the average Nordstrom salesperson, Sephora beauty expert, or Best Buy electronics expert? It’s likely your Design Consultant is responsible for a per-transaction sales amount (and profit amount) much higher than any of the above. Our industry should be leading the pack, not falling short. Let’s step to the plate and give our valued homebuyers what they so rightly deserve. Let’s raise the bar in the homebuilding industry to be the envy of all other industries.